At Modern Stone Care we work with a wide variety of natural stone flooring. This includes but is not limited to limestone, granite, marble, travertine, and slate flooring. We have spent several years working with these fragile stones, learning how to work around all of their sensitivities in order to preserve their beauty and keep them in strong, lasting condition for years to come. Natural stone, when handled properly can look incredible for decades. Unfortunately, too often natural stone flooring is not given the specific care it needs in order to last. Get the most out of your natural stone flooring with the help of Modern Stone Care. Natural Stone Cleaning: Natural stone requires frequent dusting, that should only be done with soft and specialized tools, such as a microfiber mop. While at home maintenance is absolutely necessary to preserve your stone flooring. It is equally important to have regular deep cleanings for your stone floors. This is because natural stone is a delicate material that is porous and vulnerable to dirt, dust, and grime. Natural Stone Sealing: As mentioned, natural stone is porous and sensitive to a wide range of outside factors from dust and grime, to cleaning products and wine. This makes sealing your stone an excellent way to add a little protection to it. When you seal your stone, you are adding a protective layer between the stone and any outside influences that have the potential to harm it. Natural Stone Polishing: Polishing your natural stone flooring gives it that added touch of glitz and glamour! 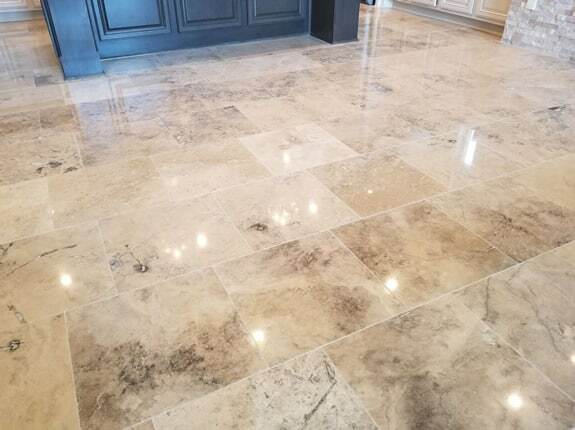 Polished natural stone elevates your flooring, taking it from a dull lackluster surface, to an eye grabbing reflective floor that catches the light and eyes of all of your guests.